Temple’s Shizz Alston and Detroit Mercy’s Josh McFolley scramble for the loose ball during the 1st half at The Liacouras Center in Philadelphia Friday, November 9, 2018. 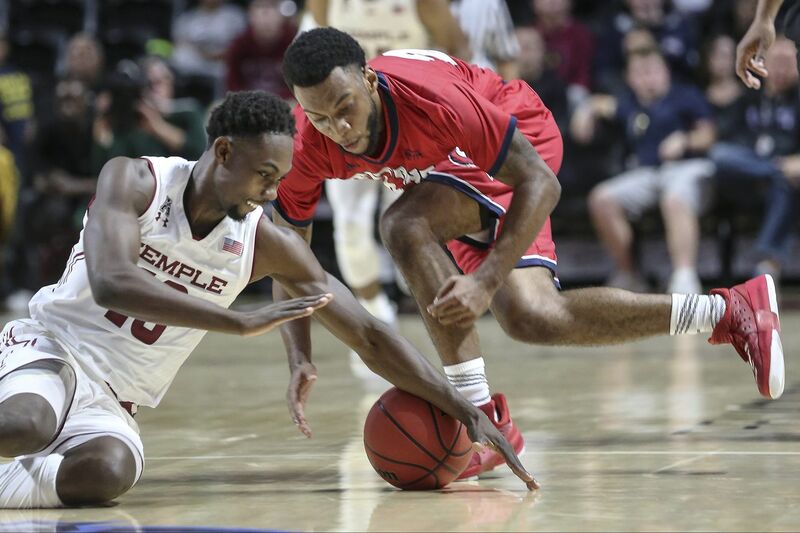 Temple's Shizz Alston isn't prone to prolonged shooting slumps, and he burst out after a rough opening game to enjoy a career-best performance. Alston, a 6-foot-4 senior, scored a career-high 30 points during Temple's 83-67 win over Detroit Mercy on Friday at the Liacouras Center. His previous career high of 25 points had been achieved three times. Alston shot 9 for 17, including 7 for 12 from three-point range and hit all five free throws. Temple is now 2-0 and the Owls will host Georgia on Tuesday, while Detroit Mercy fell to 0-2. Alston shot just 3 for 13 in Tuesday's 75-67 opening win over La Salle. "The first game I was a little bit too anxious and ready to go," Alston said. "This game I decided to take my time and let the game come to me." Temple also received 17 points from Quinton Rose, 15 in the second half, but this was Alston's night. "It has been a long time since I had 30, since high school so it felt good seeing the shots go in and helping my team win," Alston said. Detroit Mercy played zone, daring the Owls to shoot, which plays right into Alston's hands. "Definitely," Alston said. "The guards weren't that long and tall and I could shoot over them." Temple was looking to stop Antoine Davis, a 6-foot-1 freshman who scored 32 points in his debut during Tuesday's 86-79 loss at Western Michigan. Only Naismith Memorial Basketball Hall of Famer Spencer Haywood, with 36 points, scored more in his Detroit Mercy debut. Davis scored 30 points, 19 in the first half, while shooting 6 of 13 from three-point range. "I thought Trae Young snuck into Antoine Davis' body, that is what it looked like," Temple coach Fran Dunphy said, referring to Young, the rookie for the Atlanta Hawks who was an all-American at Oklahoma. "He was really good." The Owls, who committed 17 turnovers, trailed by 13-2 to start the game, and were down by 41-37 at halftime, which wasn't bad since the Titans shot 58.6 percent from the field. Trailing, 48-46, early in the second half, the Owls went on their 17-0 run, which began with a four-point play by Alston, who was fouled while making a deep three-pointer. Detroit Mercy never got back in the game, especially the way Alston was playing. He scored 15 points in both halves in becoming Temple's first 30-point scorer since Quenton DeCosey had 30 on Jan. 31, 2016 against South Florida.